Madelyn Bellas is your typical first grader. She attends George H. Mitchell Elementary School in Bridgewater. She loves cheet ahs, science and hip hop dance. 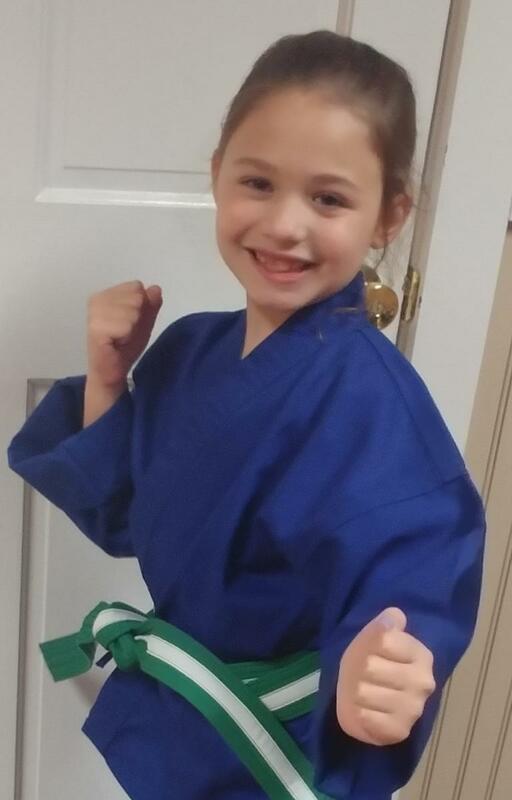 And she is training for her Black Belt at Personal Best Karate in Raynham. At the school for over a year now, Madelyn loves the classes that teach "the kicks and punches the best". She is mindful of working hard in class to leave room for the games, especially the karate bowling, her favorite. Madelyn's instructor, Joey Greenhalgh, echoes the work Madelyn puts in at class. "Madelyn is an excellent student - she works hard and has always been a leader in the class," he said. "She is a great role model." Starting class at Personal Best came after Madelyn saw her cousin take karate and was interested in trying it because "it looked cool". Her parents were on board, but for different reasons. "We thought is was good for her to learn self-defense, but also learn how to react to a situation if it happens at school," explained her mother, Jennifer. "She has learned so much from the program and we love how she has grown with it." Madelyn has an even better reason for taking karate lessons - being a big sister to her brother Nathan. Although they get along great most of the time, she did note, "If he hits me, I will say, 'hey, remember - I do karate!'"